I was munching some chips with Chris Speed, General Manager at First a couple of weeks ago. I mentioned that every time I saw a green fronted Streetlite in Norwich the more I thought it suited them. I really like the Orange and Yellow Presidents too from the outside at least. 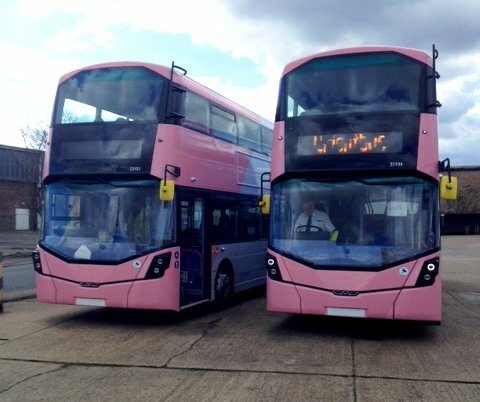 However I'm not sure I'm ever going to be as complimentary about the latest arrivals at Norwich - Streetdecks so pink even Julian Clary and Alan Carr would think twice about getting too close to them. There is pink, shocking pink, and then there's this pink. Conveniently First published a pic on Twitter this afternoon of the initial two to be delivered, 35193 and 35194. I say conveniently as although I knew a fortnight ago the Streetdecks were arriving today I had to be in Ipswich for far more disagreeable reasons. However despite Ipswich now being one of the less interesting places bus wise I did see a couple of interesting sights, both belonging to the ever expanding Suffolk Norse. The first was operating a service to my embarrassment I didn't even knew existed. I clearly have never been at Old Cattle Market at 0935 on a Wednesday before as that is when the A14 to Cambridge departs. This once a week service does Ipswich to Cambridge in 105 minutes, giving passengers over 4 and a half hours to look around the ancient city, or if they have their priorities right taking a trip on the busway. The return journey leaves at 1600 arriving back in Ipswich at 1800. I have no idea what the regular vehicle is on this service, but today it was Enviro 400 YX63 ZXH. 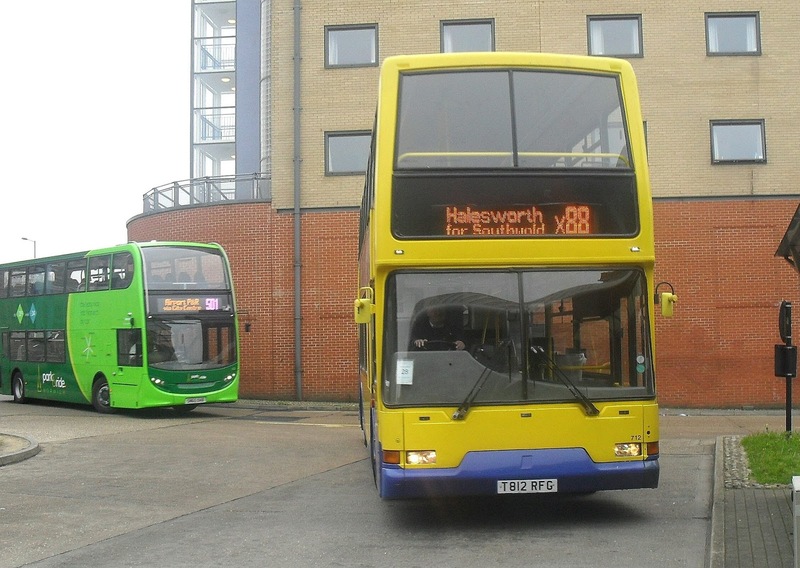 Suffolk Norse have also taken over a couple of infrequent local services in Ipswich, including the 163 to Levington. Optare Solo YJ55 BGV is a recent acquisition from Compass Travel. While searching for the history of the Solo I came across this post from East Norfolk Bus Blog which has a pic of the Solo in Compass livery. Click here to view the post. I understand Borderbus have a decker out on the 146 this week, as the seats for latest arrival BB60 BUS have yet to arrive, and some of you may have heard that this morning there was a nasty RTA between a bus and van on the A12 at Wrentham. The bus involved was Lowestoft's Volvo B7 ALX400 30889 W744 DWX which from what I can work out was running empty to Bernard Matthews. The accident happened at 0550 and it is reported both drivers were injured, the van driver seriously. That air ambulance attended and the A12 was closed for around 8 hours, causing traffic chaos and diversion to other bus services. Our thoughts go to all concerned and lets hope both drivers make a speedy recovery. After my afternoon riding Borderbus's E200MMC demonstrator on Monday I had to get down to Kent ready for my hospital appointment Tuesday and Canterbury rendezvous Wednesday. One of the things that had eluded me so far was a ride on the Short Set since the 37's took up the harness and te E200 arriving punctually meant I could start my journey south in Lowestoft, catching the 1548 to Norwich. At 1540 in she rolled in with 37405 at the what would have been technically called the London end when she left Norwich! The sometimes temperamental 37422 was on the other end, but it was having a good day and pulled her and our weight very well on the way to Norwich although it must be said 405 smoked like an old factory chimney. The noise was fantastic, the acceleration impressive and it's no wonder these locos must be paying for themselves from rail tourism alone! It's also worth remembering that the 37's are older than me, and more and more of them are being re-commissioned and relied on in preference to more modern locos. I want another trip with them and soon! On arrival at Norwich I decided food was essential and settled for the 1730 to London. Hoping it would be the ex Virgin set with the declassified 1st class coach I was in for a disappointment which turned into a smile when I saw the loco on the front. 90034 has been on loan from DB Schenker for a few months but has seen little action in passenger service. However it was out, still in DRS blue, and looking very smart. At this point I'd like to give a detailed review of the journey to London. But as I snored most of the way there I can only assume it was good. As it turns out impressively good as I managed to have a quick word with the driver when we arrived at Liverpool St, who told me not only was it the first tie he had driven 90034, but also the first time he had done that trip on his own! The loco looked even better under the Liverpool St lights. A quick transfer to St Pancras International later, which for those making the trip is far quicker if you get off the Tube at Farringdon, then catch Thameslink to St Pancras, and my trip through 50 years of rail travel reached the present day with the Southeastern Hitachi Javelins on HS1. From the UK's oldest passenger hauling locos to the UK's newest HST's in 3 hours and 50 years. What a journey, and when it works like that what a railway! The return journey yesterday wasn't as eventful with one very fortunate exception. Traveling half hour earlier than intended I arrived on the Southbound Thameslink platform at St Pancras just in tie for the Brighton train to pull in, the front 4 coaches of which was one of the new Class 387/2 Electrostars which are replacing the 442's on Gatwick Express. I know everything there is to know about the Electrostars and how they ride as I worked them intensively while a conductor on Southeastern a few years ago before my sight problems started. Quiet, smooth and rather boring! So this was all about the interior and if it was suitable for an airport service. Now here's an idea for you to chew over. If you want a train interior designed to cater for air travellers then get someone to design it who firstly travels by train, and secondly knows what an airport traveller looks like. Most of them come with at least one accessory commonly known as a suitcase. These contraptions need somewhere to sit - just like their owners - on the journey to the airport. This is commonly known as luggage space. If you are dealing exclusively with people going to one of the busiest airports in Europe it is a fair assumption that there will be a fair few number of suitcases to accommodate. Obvious isn't it. Not to the designers of the 387/2's it wasn't as luggage space is minimal to say the least. In fact the Mark 3 coaches I traveled down from Norwich on had more, and the Short Set far, far more. The only difference to a normal class 387 I could see was a little more the other side of the doors to the disabled toilet, but that was full of buggies. So we have no luggage space. Gatwick Express also charge more to go along the same rails than Southern or Thameslink do so you would expect the seats to be better and more comfortable to reflect the premium they expect customers to pay. Sorry can't oblige there either. The only seats on a train harder than those on the 387 I have ever sat on are the wooden ones on Volks Electric Railway on Brighton Beach! But what about 1st class I hear you ask. OK look at the seats above and put a tiny antimacassar on the top of the seat and hey presto - 1st class! I kid you not. But hey they are very red on the outside! So you have arrived at Gatwick after a 10 hour flight. You are charged £35 for an anytime return to London, so a family of 4 pays £105 just to get from the airport to London and back - think about that for a second - and you are faced with a train with rock hard seats and no luggage space. First impression of England!! An Anytime Return on Southern is £31 btw although cheaper deals can be found if booked in advance. So are the 387's any improvement on the original Class 73 hauled Gatwick Express trains that came complete with a luggage coach? I think not. Definitely not. Next time get them designed by someone who is aware what type of passengers will be using them. But then Govia is 65% owned by Go-Ahead. Enough said. Stagecoach have turned East Kent into an area that just uses buses in the extreme. 10 minute frequencies are not uncommon on many routes, and even the country routes seem to get late evening and Sunday services. So to develop an already thriving area even further is some task. However Matthew has arrived at the perfect time. One of their trunk routes, the Triangle serving Canterbury/Whistable/Herne Bay is getting new buses. I have hinted about them before but now I can give full details. 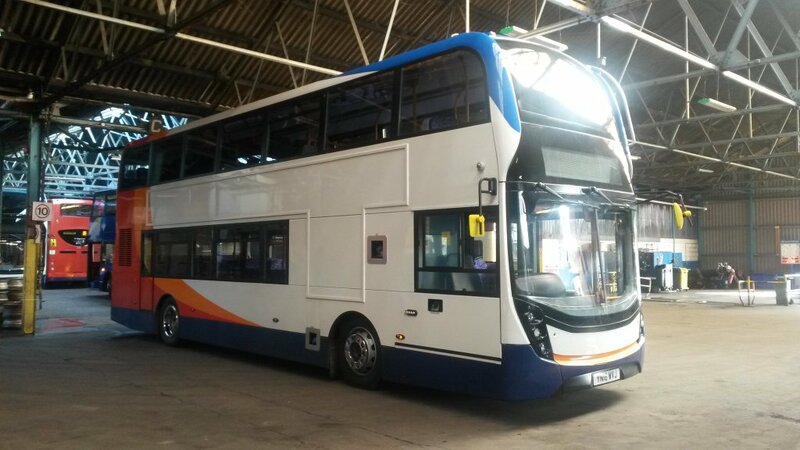 Stagecoach South East are taking delivery of 30 E400MMC's, the first double deckers in the world to be fitted with Scania Euro6 engines. 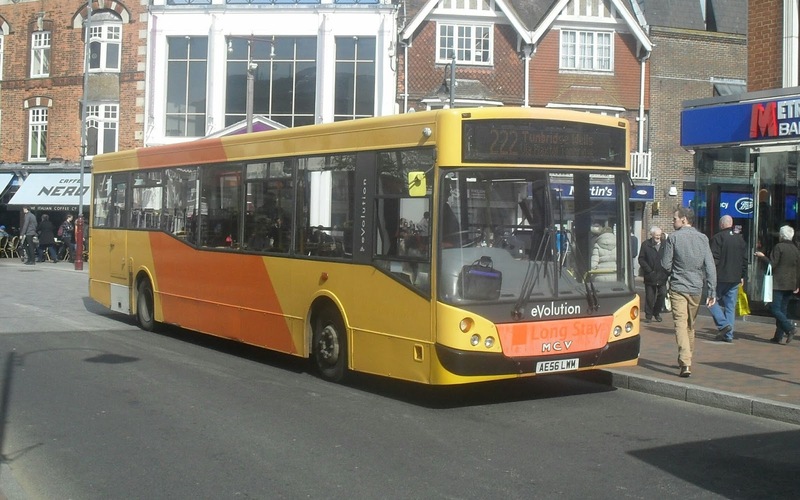 Today was the first time they had been seen in Canterbury, with two of them there for driver training purposes. Rather nice isn't it. It looks even better in the flesh, and typical of Stagecoach they haven't cut any corners. The seats are the same seats that go in Stagecoach Gold buses only with fabric covering and look of amazing quality. I wasn't allowed on one today as they are being guarded closer than the Crown Jewels, but I will definitely get to spend a day on one before their launch at the end of May. Now if you remember Chapter One you'll remember that Canterbury has a few other appealing buses - if you haven't guessed look at the header pic - and there was a scramble for the camera when the pic that had to be taken presented itself. Will the MMC ever achieve the affection the Olympian has? Somehow I doubt it. That got me in the Ollie mood and a journey was necessary. There were a lot more Olympians around today than last time and Matthew noted one departing on the 17 to Folkestone, which he said was just about the most scenic route they had. After he left to do manager type things I worked out when the Ollie would do its return journey, and got a bonus by another Olympian turning up on the 18, which briefly meets up with the 17 two thirds down the route at the little village of Lyminge. (stop it right now!) Even better was the Olympian on the 18 was from my all time favourite batch. New to Stagecoach in 1995 the N3** LPN Olympians had high ratio gearboxes, Cummins engines despite being on a Volvo chassis and many of them were fitted with coach seats for long distance routes. N366 LPN had old proper bus seats and the 18 route was nothing short of stunning. I thought I knew all of Kent but this part through Stelling Minis forest had eluded me. A fabulous route on a brilliant bus and a driver who is obviously going to miss the Ollies as much as I will, who was more than happy to wait for me to take this pic when I got off. Doesn't get better than that. A 20 min wait and the 17 came the other way, which was another wonderfully scenic route through the Elham Valley, but I think the 18 just edged it. This time a P reg example, which gave me the perfect chance to compare the Cummins engine of the N reg Olympian, with the Volvo engine of the P reg. I expect the following to create some debate - I hope so! The definition of Concorde Moment is as follows: "where great leaps are made in science or engineering and are then never used or retired because they are not business effective". The Olympian is no longer business effective. Much as I love them the look on a frustrated mum's face when she couldn't get her buggy on, and the grumbling of the old dears with their trolleys told me that regrettably the Olympian, and indeed all step entrance buses have had their day, and society has moved on. I think the Olympian is probably the best bus ever built. Yes better than the Routemaster, Leyland Atlantean, Bristol VR and so on. However there have been several incarnations of the Olympian, from the early Gardner engined sluggish plodders for London, to the glorious Olympian coaches, to the Cummins engined powerhouses to finally the Volvo engined Olympians that make up most of the surviving examples left. Not to mention infinite different bodies. I know Matthew swears that the Volvo Olympian is the best bus ever built. I'm going to disagree here. I think the Cummins engined Leyland Olympian beats them. I remember the first time I drove one in 1990 and it was like nothing I'd ever driven. Those Cummins engines sound magnificent, and when the last ones are withdrawn I do seriously think it will be a Concorde Moment - we will never see anything that grabs the bus industry by the horns in the way the Olympian did. They were the last bus built properly before the obsessions with weight and emissions meant corners were cut and sacrifices made. I love riding Olympians but that Cummins engine today made me grin like a 10yo. I'm not sure another bus will ever achieve that. Let the debate begin! Hospital day today, and I decided to bus it as I'm down in Kent already for a couple of days. The day didn't start well with an accident delaying my first bus to such an extent it cost me an hour and a late arrival at hospital. However, a terrible ride and seriously unprofessional driving on a Dart operated by the Company Which Must Not Be Named, then a much better journey on an Arriva Optare Versa I arrived in what 30 years ago was my second home. Now you would expect that the posh areas get the posh new buses, and in Kent you don't get much posher than the spa town of Royal Tunbridge Wells. However this has never been the case. 30 years ago Tunbridge Wells had the oldest Bristols, the most old Fleetlines, Leopard buses, Leyland Nationals and today Arriva, the main operator in the town has a fleet of old Tridents and Darts, with only the odd B7tl, Versa, and a handful of new short Streetlites reminding us we are halfway through the second decade of the 21st century. However one thing has changed. There are now more operators serving Tunbridge Wells than you can keep count of, and obviously I started comparing with Norwich, although obviously Norwich isn't nearly as posh not having Royal in its name! 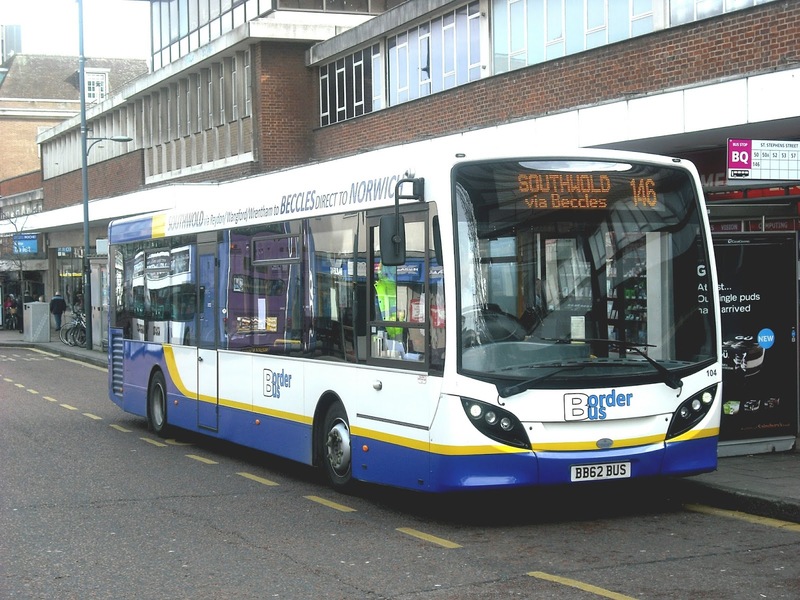 Norwich has 3 of the big operators, First, Stagecoach and two Go-Ahead companies, with Simonds, Sanders, Ambassador/Semance, some outfit called Borderbus and OurBus operating into the City on a daily basis. I'm not including coach services or one a week services. Tunbridge Wells also has three of the big ones, Arriva, Stagecoach and two Go-Ahead companies so let's start with them. Go-Ahead is represented by Brighton & Hove and Metrobus. 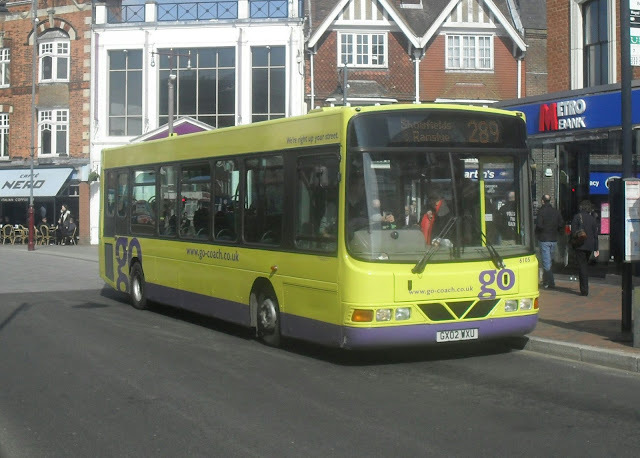 Brighton & Hove operate the 29 to Brighton, which in my youth was the 729 and shared by 3 different companies, Maidstone & District, Southdown and Brighton & Hove. Today Scania Omni City decker 685 YN57 FYP was on duty. I had to catch Metrobus' 291 to East Grinstead. When Anglian got their 3 ex Metrobus Scanias last year I said I was prepared for the state they were in as I had traveled on similar buses down South. 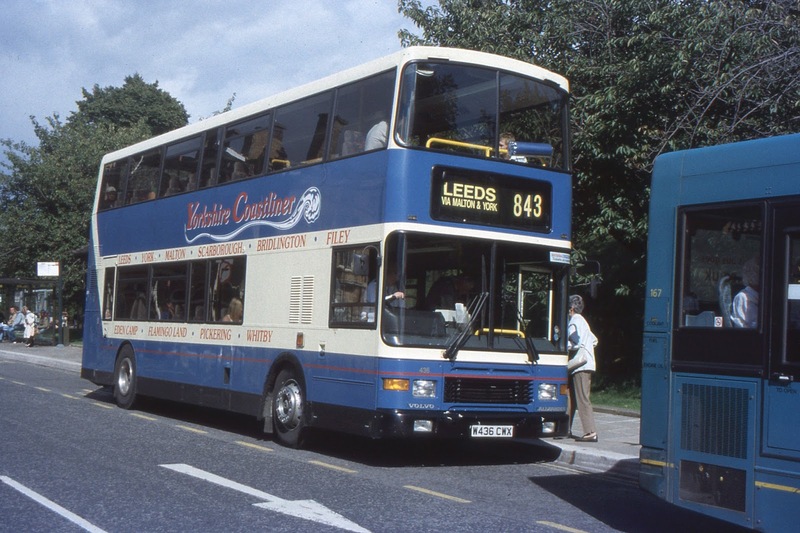 Well those same Scania deckers are still very much in use and the first one I went on was truly awful. The second one, though, was a little better and came with a surprise. Any hopes I had of new deckers for Metrobus in that area appear to have been dashed with 6475 YN53 RYF turning up in a new livery! Mind you what's the point of a yellow flash if most of it is covered by adverts! So to the numerous independents serving the area. First up is Go Coach. You might remember I went to their open day last year - might be this year too - and they appear to be ever expanding. They now operate a town service in Tunbridge Wells and here is ex Eastbourne Buses Daf Cadet GX02 WXU on the route today. I happen to know the chap who designed that livery and what a fine livery it is! 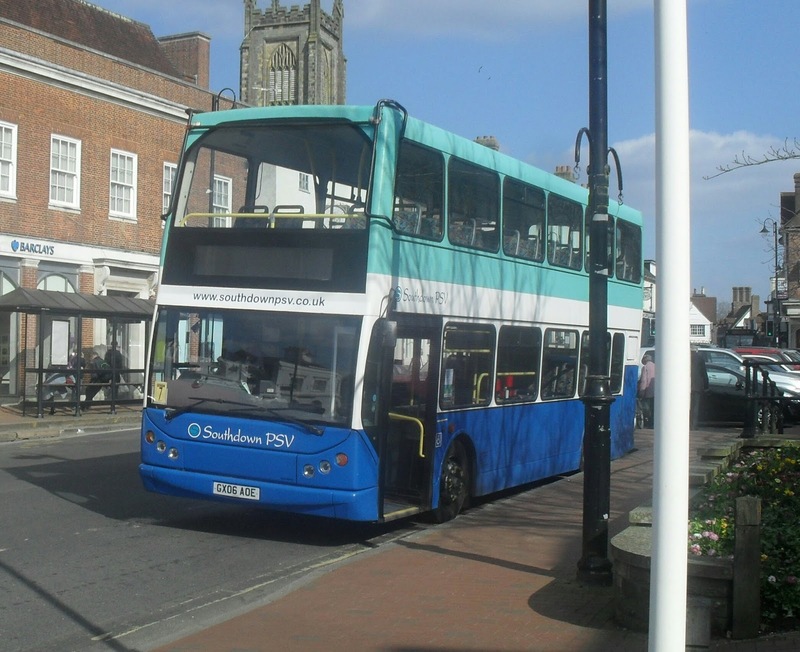 Southdown PSV are a small company operating out of Copthorne in West Sussex, near Gatwick, and should not be confused with the former Southdown National Company of the past. They don't operate into Tunbridge Wells but when I got to East Grinstead this was the first thing I saw, an East Lancs Mylennium bodied Volvo B7tl which was new to the company looking rather smart in the sunshine. The vehicle that had me dashing for Google was this one. Still in Glasgow Airport livery this Daf MCV Evolution now belongs to Autocar Bus & Coach Services of Tonbridge who operate a few local services as well as being closely linked to Wealden bus sales.. The Evolution had just arrived on the 222 from Borough Green, a route that has seen some truly weird and wonderful vehicles over the years. And finally if anyone knows of anywhere else that still has a Leyland Titan running round it then let me know. T907, formerly of London Central's New Cross Garage A907 SYE is still to be seen mornings and aftenoons in Tunbridge Wells. Unfortunately the operator doesn't like publicity so I'll show the pic and that's all, but what a fine relic of the past! Btw she was on her lunch break when I took this pic hence the "not in service" blind! On this sad day I feel I should mention that I have only been to Brussels once. That was in 1984 when I was on tour with a youth orchestra. I loved Brussels, a really relaxed and friendly place - the way everyone got round town was believe it of not by hitch hiking. 32 years on I would doubt that is still the case. Public transport is always going to be the target of nutters - it is an easy target that is impossible to keep 100% safe. However if we stop using it the nutters win. That's why I went through that tunnel between Liverpool Street and Aldgate on 7th July last year, and why I'll come back through London the usual way on Thursday. The best way to show those who want to paralyse the transport system and those using it with fear is to carry on using it as usual. My prayers and tears go to those who suffered today doing what I and millions of others do everyday. We will not be stopped. We will not be intimidated. We will not give terrorism one glimmer of satisfaction. I will be on the Tube on Thursday. Go to my nearest station on the East Suffolk line, and it's fair to say that not much variety would be on view. 170's and 156's are about all you'll see. For real variety and to see the odd something really different you have to venture to Ipswich, or even Peterborough. Not much fun on a cold murky Saturday. But how about a place where you can watch plenty of railway action and the footy at the same time? That is where Railcam comes into its own. 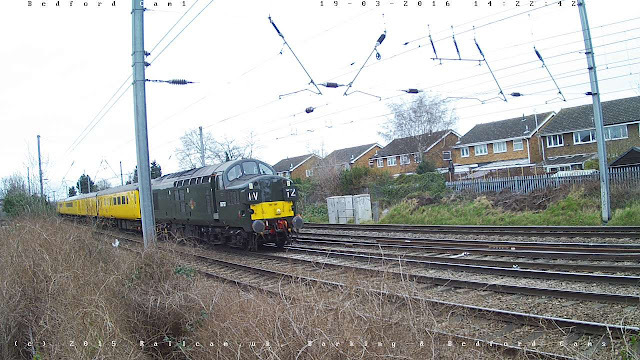 Home to 32 webcams overlooking railway lines all over the country from Deal in Kent to Sanquhar in Scotland you can watch the action without needing to put your anorak on. Thanks to the power of screenshots here is what I have been watching today. All pics still copyright to Railcam. First up is something from the Watford camera. DRS 66431 took 37419 from Crewe to Wembley. At Wembley the two separated and 37419 carried on under her own - erm - diesel I guess to Norwich. 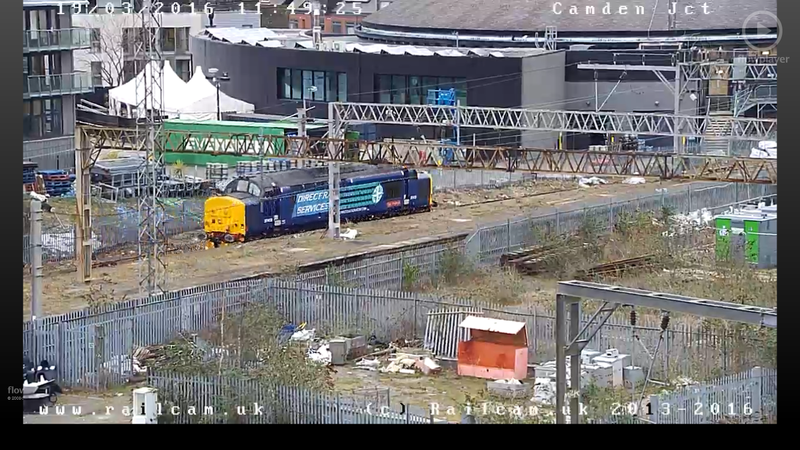 Here she is on the Camden Jct camera. 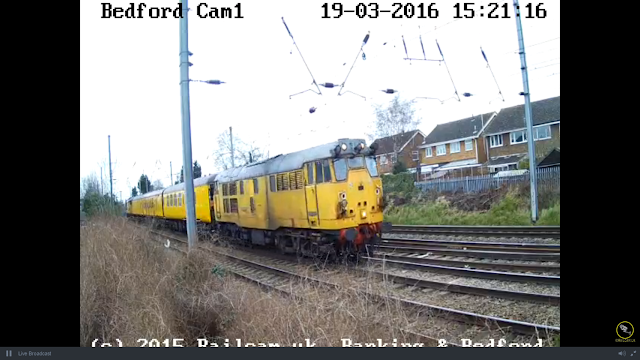 You will know that some of Thameslink's 319's were transferred to Northern Rail recently. 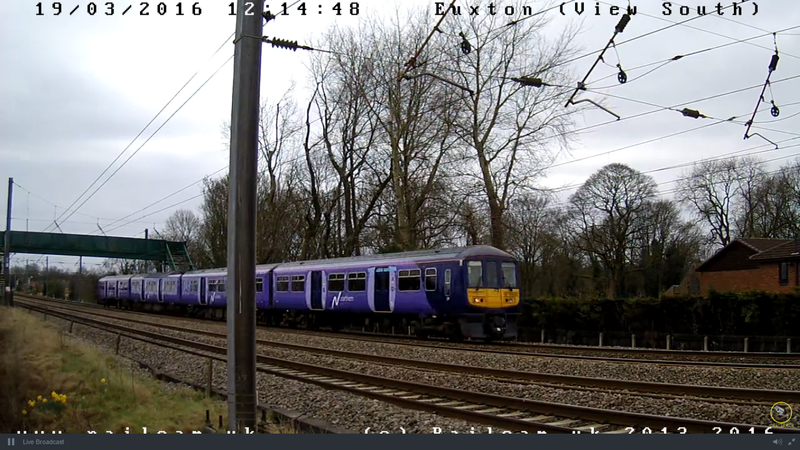 It's a long way to go to see them now, but no worries - here's one passing Euxton cam in Lancashire. Obviously freight is a regular sight around the country. 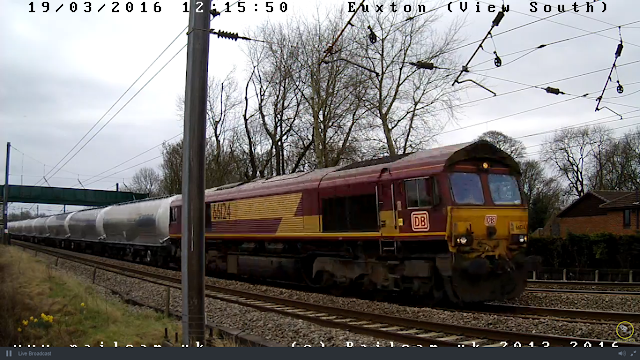 Here is EWS 66124 with a load of tanks again at Euxton. There have been a few Network Rail test trains floating around today. One of them was on the Settle - Carlisle line and as a real bonus it was Network Rail's HST. 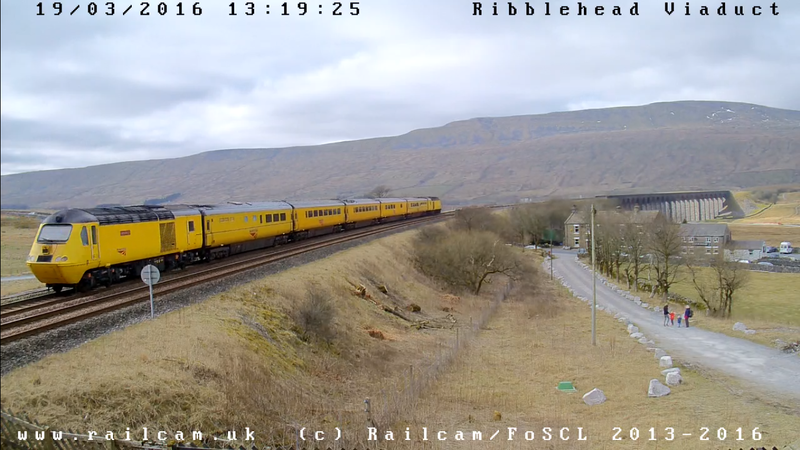 There are two cameras at Ribblehead and with some quick mousework I was able to catch it at Ribblehead Station and about to cross the famous viaduct. It has been a good day for 37 spotting. However a lesson was learned. If you are waiting for a train to pass, especially when you know it's going to be a green 37 do not look up at the footy or you'll miss it! 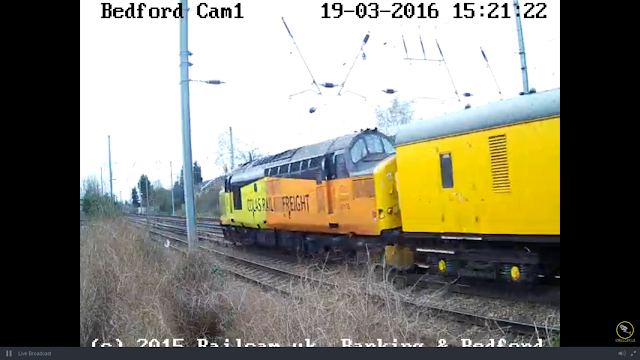 I did just that so am using Railcam's own autostill taken by one of the Bedford cameras. However I was glued to the screen to press the button half hour ater when another test train went past, this time with a rare Class31 on the front and a Colas Rail Class 37 on the back. To finish with here's one I took earlier, as they say. You will all remember the hype, enthusiasm and in some cases sheer lunacy that accompanied the return of the Flying Scotsman a couple of weeks ago. Well us armchair anoraks were a bit underwhelmed as we had already seen it weeks before! Here is the beast at Clitheroe on 4th February on a test trip. I truly cannot recommend Railcam highly enough. To get full benefit you need to become a supporter, which will give you access to all the cameras. This, however, only costs £10 a year - although if you can afford more they will be very grateful. There are also cameras on 5 heritage lines including the Romney, Hythe & Dymchurch Railway and the Swanage railway. There are live diagrams covering most of the country so you can track the trains as they move around the country, and links to realtime trains for up to the minute information and schedules. 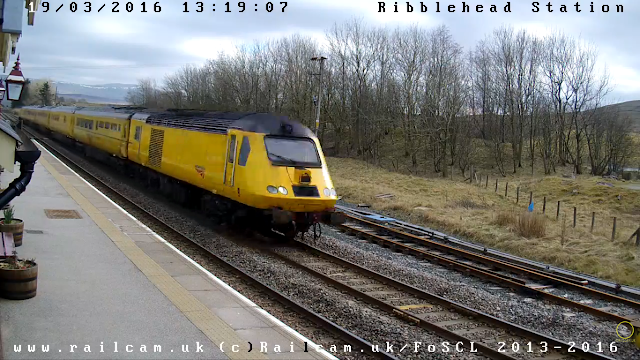 Go to http://www.railcam.uk/site/ and see for yourself. 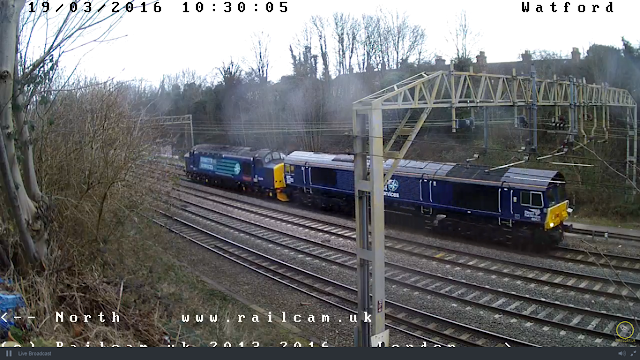 My thanks to Railcam for allowing me to use the images and I hope you enjoyed this view fro my sofa! My church minister Mother invented a new word a few years ago. The word is "Godincidence" the definition of which is as follows: noun, a sequence of events so incredible it has to be more than coincidence. Well I'm neither here nor there on that subject, but this morning's events certainly fell into that definition. I had booked a minibus to take me to Wangford, so I could catch the 61 (which I rarely catch from Wangford) to Yarmouth and raid Nichols the butchers, who do high quality meat at very cheap prices. Normally on a Tuesday it involves a long but pleasant journey around the country lanes of Suffolk picking up people en route. However this morning for the first time in living memory one lady cancelled, so I was left with the prospect of arriving in Wangford just under an hour early, and believe me nice as Wangford is it is not a thriving metropolis of activity with refuge for the waiting traveler. So I persuaded my driver to take me further up the A12 to Wrentham, where I knew a cafe was open. It was from that cafe that I saw a BorderBus decker heading light towards Southwold. Surely not! A decker on the 146? A quick exchange of messages to Borderbus confirmed that yes there was indeed a decker on the 146 as the E300 was in for MOT and the pocket rocket BB07 is having a major sulk..Better still Malcolm was driving and that guaranteed some photo stops! And so at 0955 precisely Plaxton President Volvo B7tl 207 came round the corner. Now at this stage I must mention that a few people have been nagging Borderbus supremo Andrew Pursey to put the occasional decker on the route. Obviously this can't happen until proper destination screens are fitted, but I can tell you the decker went down very well with the passengers and quite a few went upstairs. Since Pontins are one of the main targets of the 146 it's worth "Pontin" out again that holidaymakers like doing things they don't normally do in their regular lives - and that includes going upstairs on a bus. It's one of the reasons the X1 does so well over the 7. Yes local concessionary pass holders like downstairs but tourists and their kids love upstairs. Food for thought especially if those journeys operated by deckers were advertised in the timetable. Anyway regular readers will know I'm not the greatest fan of Presidents. there are a few decent ones knocking around - Chambers have a few for example, but for its age 207 is a gem. Goes well, comfy seats, extremely warm and barely a rattle to be heard - Hogwarts' Beccles outstation has done it again! We arrived at Norwich, and I took time to work out the chain of events. If I hadn't needed to go to the butcher in Yarmouth (not just for me) I wouldn't have booked to Wangford, but if I HAD gone to Wangford I wouldn't have seen the decker. So if that lady hadn't cancelled I wouldn't have been in the cafe and anyway I'm sure you get the picture by now! It turned out ok! A decker on the 146 in Norwich. As rare as it gets! I then dashed to Yarmouth and back on the X1 (37274 (nice) out 33823 (not great) back) and met up with Chris Speed for a natter over a sausage and chip lunch. Unfortunately I can't tell you a word of what he told me - yet! Suffice to say some interesting happenings coming soon that should get the comment count going! On the way to Davey House I saw another unexpected sight. A few days ago I published a pic of a baby Lynx on loan to Simonds on the 86. I had already seen that Tempo in the bus station so when another one passed me on the 1 I realised the other baby Lynx PF10 MDX had escaped and found its mate. My luck continued when the driver had his break down at Riverside and so I was in position when it arrived in St Stephen's Street on its return journey, on the 2 this time. Another blue bus I saw, though this time with a tinge of sadness was former Norwich Park & Ride Trident PN03 ULT, now in Norwich School colours. I say sadness as it replaced the old Volvo B10M Citibuses and the Trident engine has none of the unique clag and character of those B10M engines. And that was about it, I thought, until I got back to the bus station and realised what was going to operate the 1600 X88 to Halesworth. When Hedingham returned ex Brighton & Hove Loylne Trident 712 to Anglian it was widely assumed, though not by me, that it would be parked up with all the Hedingham Olympians in the graveyard and left to rot. But no! She is out in service and giving a quite superb ride. Comfortable, no rattles, fast, and thanks to the Dart engine now fitted much quicker off the mark and no whining. Even the driver, who was seriously nonplussed when he first saw it admitted it was better than any of the Scania deckers. I would be seriously tempted to get 712 DDA converted and continue to use it. Is it now the oldest decker in regular use in Suffolk, if not Norfolk too? Anyhow it was a surprisingly good end to a very surprising and unexpected day. Anglian 712 pulls on to the stand at Norwich. Glad I had the front bus! Only good news in today's post, which makes a pleasant change. Unsurprisingly we start in Beccles with Borderbus, who have revealed the latest expansion of the 146, which comes into effect on March 29th. The first journey of the day, the 0705 from Carlton Colville will now start from Kessingland at 0655. There will also be a new journey leaving Southwold at 0642. Both journeys will serve City College in Norwich. In a slight re-organising the 0837 from Worlingham will no longer start from Carlton Colville non schooldays, and the 0845 departure from Southwold will now start at Kessingland at 0908. However the 0927 from Wangford is extended to start at Southwold at 0915. The 1152 departure from Worlingham will now start at Southwold at 1105, giving a half hourly service along the whole route between 0915 and 1135, and from then a half hourly service between Kessingland and Norwich. The biggest improvement is the reduction in non school day only journeys, with only the 1428 from Kessingland falling into that category. This means the 1545 from Southwold to Norwich now runs school days too. Towards Southwold the 0833 from Beccles will now start from Wrentham at 0914. There is an additional departure to Southwold from Norwich at 0950, and the 1050, 1140, 1240 and 1340 departures from Norwich are extended to Kessingland. The 1510 to Southwold now runs on school days too, with only two journeys differing on school days - the 1430 will terminate at Beccles instead of Kessingland, and the 1540 to Kessingland will only operate non school days. These changes mean a regular service throughout the day with no big gaps on school days. This was much needed and will only enhance the ever more popular route. You can view the full timetable by clicking here. OK for you to quote those figures, as the BB Team are all very pleased with them. The figures in question are as follows. I would suggest many operators would quite like increases in productivity such as those. To get 20% more passengers in January when Pontins is shut compared to June when it is bursting shows how much more of the local market has been attracted by the service Borderbus provide on the 146. I really like the way Andrew emphasises the fact it's a team effort, and he is right. Without the drivers welcoming everyone on board, giving everyone time to sit down and driving to a timetable that allows for those courtesies, to the engineering team that achieve miracles in making E200's a pleasure to travel on, to the fact there are ALWAYS timetables available (acknowledging that a lot of the older generation are not gadget mad and still prefer paper timetables) then you could be the best MD in the world yet would achieve nothing. With Robin and Lee joining the team in the next couple of weeks things will only get better and better. I still think the Border Bendis will be needed come high season! It shows it CAN be done with the right attitudes from top to bottom, and by everyone feeling needed and appreciated. Other operators take note. Now a few weeks ago I mentioned I was going to be involved in something quite exciting at Stagecoach South East. I was sent a picture on Friday of one of the first deliveries on what on the outside is a brand new E400MMC, and indeed it is. However it's what's under the bonnet that makes this batch of MMC's a world first, and I will be revealing all soon. I'm meeting with the Business Development Manager at Stagecoach South East next week and I'm hoping to persuade him to show me round one of these impressive vehicles! Watch this space. Finally another preview of an upcoming post. Robert Appleton has sent me pictures he took of the Yarmouth Olympians in their days at Yorkshire Coastliner, and my word they looked good. A full post coming up in due course but here is a taster with a pic of 436, later to become 34109 in her Yorkshire Coastliner glory. Many thanks, Robert.